A developmental reading text for students who need to sharpen their comprehension skills before delving more deeply into critical reading. 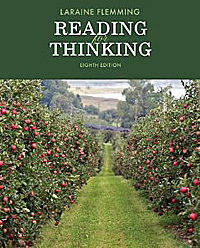 As it has from the first edition, Reading for Thinking tries to take the mystery out of critical reading. It suggests that reading critically does not require a new set of skills different from those associated with comprehension. Instead, students learn how to expand their notion of what understanding the author's message means. Like previous editions, this new edition shows students how analyzing arguments is another way of looking for main ideas when the author's purpose has switched from informative to persuasive. Chapter by chapter, the meaning of comprehension gets expanded in order to include evaluating a writer's purpose, recognizing tone, separating fact from opinion, and determining the author's degree of bias. The eighth edition continues to focus on three skills essential to academic work, paraphrasing, summarizing, and synthesizing. But this time around, there are more concrete pointers and examples that show students, step by step, how to determine what's important in a text, translate that information into their own words, and then combine ideas from different sources. The eighth edition offers a host of new readings, a new vocabulary feature, brand-new material about reading on the Web, and new marginal think alouds, which model the skilled reader's response to different kinds of verbal clues. The new edition also expands the use of writing assignments, designed to make student readers recognize and respond to the various techniques writers use to communicate with their audience and,in the process, become better writers, as well as better readers. Heredity or Environment: What Can Identical Twins Tell Us? Are Today's Students Lacking in Empathy?